On 2 November 2008, kennysideshow produced an important article on Rahm Emanuel who might become Obama's Chief of Staff. The article contains material from a variety of sources. 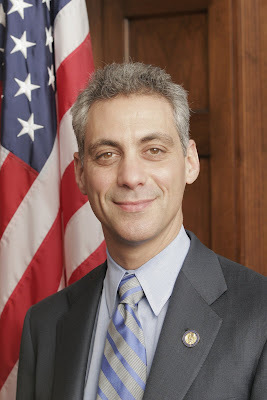 A Look at Rahm Emanuel - Obama's Chief of Staff? an Israeli son-of-a-terrorist (Heb. "ben zonah") and Zionist extremist. "Barack Obama's campaign has approached Illinois Rep. Rahm Emanuel about possibly serving as White House chief of staff "
Who is Rahm Emanuel, Obama's prospective Chief of Staff? I think these three are a *must read* for anyone contemplating an Obama vote. Currently Obama is being very oblique when asked to confirm the reports that he approached Emanual to offer him this position. This makes sense. Obama is clearly a puppet in all this, and the real decisions will be taken by the puppeteers, In fact, there is a good chance that Emanuel himself is one of the puppeteers in this story so the decision to come out from the safer world of behind the scenes politics is probably his to make. Still, Chief of Staff is an immensely powerful position to hold (just remember Don Regan) and it would allow Emanuel to control Obama's activities 24/7. Again, the mere fact that Obama would even contemplate placing himself in the hands of a Uber-Zionist like Emanuel should obliterate any hopes anyone could have harbored about Obama being a lesser evil or a candidate for change (although the "change" thing really got voided at the choice of Joe Biden for VP, the ultimate non-change politician). Guys, don't do it! You will hate yourself for at least four years if you vote Obama. Either abstain, or vote Nader or McKinney, but don't do this to your conscience. Don't vote for AIPAC's puppet! The new "golden boy" of the Democrat Party, the Israeli-American congressman Rahm Emanuel, is the son of a terrorist. Really, I am not making this up, the chief power-broker of the Democrat Party, the 5-and-a-half foot foul-mouthed Israeli named Rahm, is the son of a terrorist – a real living terrorist. So, what do we do as citizens of the land of the free and the home of the brave fighting the War on Terror? Do we run and hide from the foul-mouthed little Israeli who danced ballet and swears for effect - or do we laugh? Or do we demand answers? How can we respect a U.S. Congressman who served in a foreign army and whose father was a terrorist? Rep. Rahm Benjamin Emanuel, the Democrat congressman for the 5th District of Illinois in Chicago is the son of an Israeli terrorist. Rahm's father, Benjamin, was a member of the Irgun, the Zionist terrorist organization that coined a new word as they blew up hotels, train stations, and other buildings in Palestine in the 1930s and 40s. Of course you won't find anything Rep. Emanuel's father's exploits in Palestine on Rahm's website. The late Sherman Skolnick of Chicago called Rahm Emanuel the "Acting Deputy Chief for North America of the Mossad – Israeli Intelligence. Was Skolnick correct? Skolnick does not document his claims. It would, however, be most interesting if Rahm's mother were actually related to Moshe Smulevitz, the Zionist who went to Berlin with Pino Ginzburg to arrange the transfer of Jews and money to Palestine – with the Nazi regime. "I said before the election that if the Democrats win the House, the lion's share of the credit should go to Rahm," says Rep. Ray LaHood, an Illinois Republican. "He legitimately can be called the golden boy of the Democratic Party today. He recruited the right candidates, found the money and funded them, and provided issues for them. Rahm did what no one else could do in seven cycles." 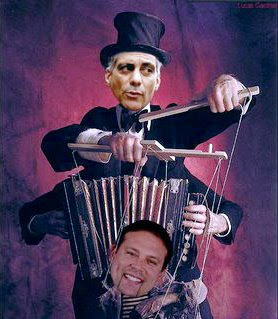 Rahm Emanuel’s younger brother, Ari Emanuel, is Michael Moore’s agent in Hollywood. He encouraged this latter to point out the supposed responsibility of Saudi Arabia in September 11 attacks in his famous film Fahrenheit 911, the showing of which was ensured by the Democratic Party. This article has also been posted in TruthSeeker and Rumor Mill News. In the same way, the U.S. administration of President Bill Clinton was very much dominated and controlled by Zionist advisors like the Israeli Rahm Emanuel, who dominated the Clinton White House. Emanuel, the son of an Irgun terrorist, was the person who is reported to have "single-handedly" pushed NAFTA through. He now controls the agenda of the Democratic Party and has a great deal of influence over the party's presidential candidate, Barack Obama. Right after Barack Obama's speech to AIPAC this morning he was endorsed by Rahm Emanuel, a leading member of the House. Emanuel, who belongs to an Orthodox Jewish congregation in Chicago, then accompanied Obama to a meeting with AIPAC's executive board, Mark Halperin reports. The entire Obama AIPAC speech is here. For Dresdner Kleinwort Wasserstein, An Investment Bank, From 1999 To 2002. Between his White House and congressional years, Emanuel made a small fortune in investment banking and sat on the board of housing finance giant Freddie Mac, which the government seized in September along with Fannie Mae. (He recuses himself from any House votes pertaining to Freddie.) Workers in the securities and investment fields have donated more than $1.5 million to his four House campaigns, according to the Center for Responsive Politics. When the crisis intensified late last month and administration officials urged Congress to act, Emanuel pushed for a massive response to calm markets and the public. He took a lead role, along with Rep. Barney Frank (D-Mass. ), in negotiations with the White House and Republican leaders, and he convened six caucus meetings in the span of a few days to explain the issue to fellow Democrats. Emanuel worked past midnight Saturday trying to win votes from both sides of the aisle, earning praise from Speaker Nancy Pelosi (D-Calif.) on the House floor. After the House rejected the package, Emanuel needed more time to negotiate, and he asked his rabbi for permission to work on Rosh Hashanah to help resolve the crisis. As Emanuel recounts it, the rabbi assented, noting that there is an exception to many religious rules if the health and welfare of the nation is at stake. Emanuel teased him, "Does that mean you have a 401(k)?" The rabbi answered, "I'm only thinking of the nation." The incumbent in my district, Rep. Rahm Emanuel (D-IL-05), received over $800,000 in contributions in 2007-2008 from securities and investment firms, insurance companies and commercial banks. Rep. Emanuel has always been an entirely client-oriented politician; his latest outrage merely makes obvious who his real constituents are. Our government continues to shed, bit by bit, its last pretenses of public service, and we are less free, less prosperous, less safe and less respected every day for it. If the people fail to effect real change in November, their opportunity to do so ever again may be lost. They will be too caught up in the struggle for survival to care any longer about freedom, justice or peace. Originally Posted by kenny's sideshow.